21 December 1909: Entered the Army as a Fähnrich in the Infanterie-Regiment Großherzog Friedrich Franz II von Mecklenburg-Schwerin (4. Brandenburgisches) Nr. 24 after passing out from the Cadet Corps. 3 July 1910-10 April 1911: Detached to the Potsdam War School. 1 February 1914: Detached to the Machinegun Company of Infantry Regiment 24. 20 October 1914: Wounded/in hospital. 15 February 1915: Detached as an Instructor to the Machinegun Training Course in Döberitz. 8 April 1915: Company Leader in Infantry Regiment 24. 30 September 1916: Machinegun Officer on Staff of Infantry Regiment 24. 14 October 1916: Regimental Adjutant of Infantry Regiment 24. 23 October 1918: Adjutant of the 12th Infantry Brigade. 1 April 1919: Adjutant of the Berlin II District Command. 1 August 1919: Transferred to Reichswehr Infantry Regiment 30 and Adjutant of the Field Supplementary Battalion of Reichswehr Brigade XV in Angermünde. 1 December 1919: While retaining his previous position, transferred to Reichswehr Infantry Regiment 103. 1 February 1920: Adjutant of the Garrison Command in Brandenburg/Havel. 15 May 1920: Platoon Leader in Reichswehr Infantry Regiment 5. 15 October 1920: Commander of the Training Battalion of the 5th (Prussian) Infantry Regiment. 17 July 1922: Signals Officer on Staff of the 5th (Prussian) Infantry Regiment. 12 March 1923: Regimental Adjutant of the 5th (Prussian) Infantry Regiment. 1 October 1927: Chief of the 11th Company of the 5th (Prussian) Infantry Regiment. 26 November 1928-9 December 1928: Detached to the Gas Protection Course in Berlin. 1 October 1931: Transferred to the staff of the II. Battalion of the 5th (Prussian) Infantry Regiment. 1 February 1932: Adjutant of Infantry Leader II and Commander of Mecklenburg. 1 October 1933: Transferred to Schwerin Military District Command. 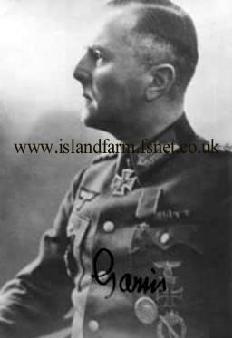 15 October 1935: Commander of the II. Battalion of Infantry Regiment 2. 12 October 1937: Commander of Teaching Group B at the München War School. 1 March 1939: Army High Command Leader Reserve, then placed at the disposal of Wehrkreis [Military District] VII and then delegated with the training of the Landesschützen (“Territorial” or Local Defense Forces) Units in Bavaria. 31 December 1941: Delegated with the leadership of the 98th Infantry Division on the Eastern Front. 1 February 1942: Commander of the 98th Infantry Division (to 1 February 1944) on the Eastern Front. 1 April 1944: Army High Command Leader Reserve. 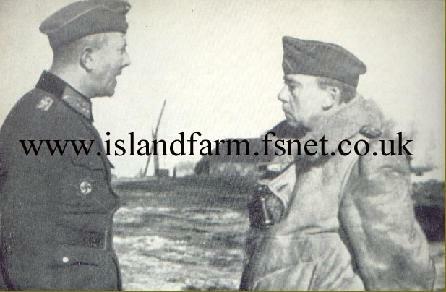 5 May 1944: Commander of the static 264th Infantry Division in Dalmatia, Croatia. 9 October 1944: Army High Command Leader Reserve. 19 January 1945-2 May 1945: Delegated with the leadership of the XXXXVI Panzer Corps on the Eastern Front (West Prussia and Pomerania). 2 May 1945: Prisoner of war in British captivity. 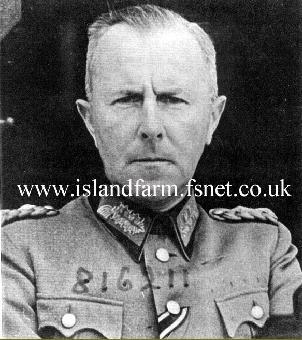 8 May 1945-June 1945: German Liaison Officer between the Headquarters of British Field Marshal Sir Bernard L. Montgomery (21st Army Group) and the Prisoner of War Camps of the British Army. June 1947: Released from captivity. 1956: Published an historical account of his former division: Kampf und Ende der Frankisch-Sudetendeutschen 98. Infanterie-Division (Battle and End of the Frankish-Sudeten German 98th Infantry Division). Knight’s Cross of the Iron Cross: 29 November 1943, Generalleutnant, Commander of the 98th Infantry Division. German Cross in Gold: 18 October 1941, Oberst, Commander of Infantry Regiment 282. Prussian Royal Hohenzollern House Order, Knight’s Cross with Swords: 30 September 1918. Romanian Order of Michael the Brave, 3rd Class: 12 July 1944 (Royal Decree No. 1297).